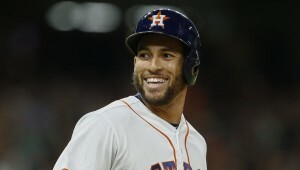 George Springer of the ​Houston Astros is the spokesperson for SAY, the Stuttering Association for the Youth, and he's helping make a big difference in the lives of children with stutters. Some of Springer’s teammates came out to support the event, including Chris Devenski, Brad Peacock, Tony Kemp and Lance McCullers Jr. Springer was awarded the SAY Hero Award this year and finally accepted it Sunday from a young boy Finn, who called Springer an “inspiration” ​both on and off the field. Not just an inspiration to those kids, but to us, too, to do something more with ourselves. Keep up the amazing work, George.